Sepia brown or reddish-brown with underparts of a dirty cream color. Secretions from ventral glands give an orange appearance in males and juveniles. Madagascar, present only in small forest “islands” in the country’s interior. Forest dwellers; found in rainforests, savoka (humid forests), montane forests, and spiny desert forests. Most often found in intact forests but will Inhabit fragments in close proximity to an intact forest. Quadrupedal; equally comfortable on the ground and in the trees. They will leap from branch to branch and cover long distances on the ground. Generally most active at night but also active in daylight. Daytime activity declines in the hours after dawn and even further at midday. Females are solitary; males live alone or in small groups. Lemurs often compose >50% of prey items. Other prey include tenrec, rodents, snakes, birds, lizards, and amphibians. 19-20 years for both males and females in managed care. No records for animals in the wild. © 2015-2018 San Diego Zoo Global. IUCN Status updated Sep 2018. 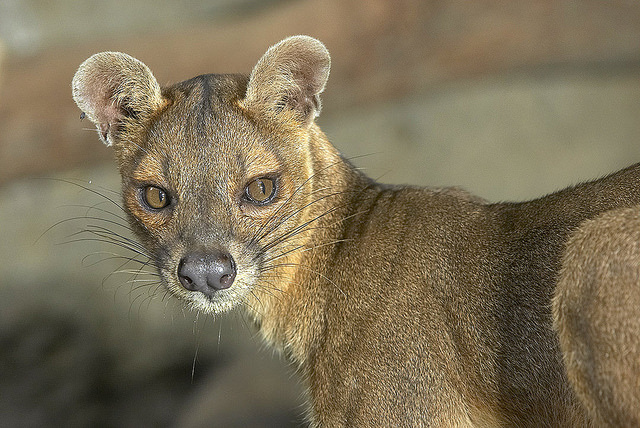 How to cite: Fossa (Cryptoprocta ferox) Fact Sheet. c2015. San Diego (CA): San Diego Zoo Global; [accessed YYYY Mmm dd]. http://ielc.libguides.com/sdzg/factsheets/fossa. We wish to thank Mandi Krebs for providing expert content review of this fact sheet. Ms. Krebs began working with fossa in 2002 in preparation for opening the largest nocturnal exhibit in the world, Kingdoms of the Night at Omaha’s Henry Doorly Zoo and Aquarium. She created the first North American Regional Fossa Studbook in 2006 and is the AZA Fossa SSP Coordinator and Studbook Keeper. She is currently the Interactive Animal Programs Manager at Omaha’s Zoo and still cares for the first fossa she ever met.